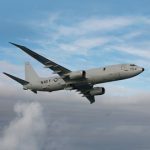 The governments of U.S., U.K. and Norway have agreed to establish a trilateral partnership on the operation of Boeing-built P-8A maritime patrol aircraft, Defense News reported Monday. 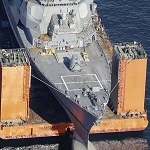 A DoD official told Defense News that the partnership has not been finalized and that areas of cooperation could include operations in the North Atlantic, information sharing and co-location of maintenance and training assets. The U.K. seeks to procure nine P-8A aircraft while Norway looks to buy five copies of the P-8A platform. USNI News reported Friday some naval analysts believe the three countries plan to boost joint anti-submarine warfare operations in response to Russia’s submarine activities in the North Atlantic. Bryan Clark, an analyst at the Center for Strategic and Budgetary Assessments, told USNI News the agreement could allow for sharing of airfields, maintenance facilities and equipment. Tags anti-submarine warfare Boeing Bryan Clark Center for Strategic and Budgetary Assessments Defense Department DoD featured govcon Iceland maritime patrol North Atlantic Norway P-8A Russia trilateral partnership u.k. U.S.